The yoga session begins with body and breath awareness, the focus of the session is connecting to our breath which is used as a tool to guide us through the Asana flow and help us to release tensions bound-up in muscles and joints. We practice Pranayamas to re-energise, strengthen and balance. Mindful meditations and relaxation techniques are used to increase inner awareness and induce a feeling of calm and peace. These yoga classes are suitable for mixed levels as I encourage each individual to be creative in their practice and to make it their own. These sessions are about learning to let go of our anxieties, tensions and pain. A series of gentle stretches and mindful breathing and visualization techniques teach you how to let go of resistance and blocked energy. The session ends with a deep relaxation called Yoga Nidra (yoga sleep). I lead you through a series of instructions which you follow with awareness to a state of quiet and stillness. When the body is relaxed the healing can begin. These classes are suitable for all levels and the workplace. 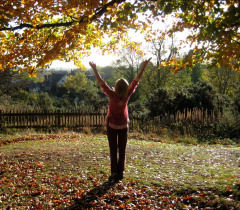 A 6 week introduction course into the Art of Mindful Living, Cost £75 a max of 8 people. I see yoga as a wonderful gift that helps us realise our full potential. An invaluable tool to help us live healthier, happier and more balanced lives. My style is gentle and sensitive with Mindfulness being the thread which runs through all the sessions. I encourage all my students to respect the body’s limitations while exploring new boundaries and possibilities, also to integrate what they learn on the Yoga mat into their everyday lives. The AIM of my classes is to RELAX mind and body, to restore energy by letting go of resistance and to find a bit of PEACE in our everyday lives.